I saw a lot of activity on Twitter today about the fact that the game is actually being kickstarted: http://www.kickstarter.com/projects/... They've already received 4 times their goal with 31 days to go. After having played a half hour of the game it's hard to fully place it. It's a RTS game with RPG skill advancement. Also, it has a definite TBS aspect in that you can choose when to jump to the next zone (which results in choosing when to encounter the next RTS fight). I regret not getting in on this Kickstarter. Hoping to see it on Steam pre-order, maybe. EDIT: The unlocking of new ships via milestones sounds very Binding of Isaac-esque. FTL and Binding of Isaac are both very rogue-like so they share several similarities. I've played through two games, I've made it to Sector 2 and died trying to jump to Sector 3 when the fleet caught up to me. Next time I'm definitely going to jump to the next Sector sooner rather than hopping around everywhere first. You definitely can't explore every area and that's what I was trying to do. I've received a drone and drone parts but didn't have the component installed on my ship to launch them, I haven't figured that out yet. I've found two ways of gaining crew so far. The first was a distress beacon which led to a single survivor on a planet surface. He seemed pretty crazy and I had a choice of leaving him or taking him with me. It said he became much more normal after being saved, I'm guessing this can randomly go bad for you, maybe becoming hostile when you save him. The second method was a slaver ship. They offered to sell me a slave for like 50 scrap which I didn't have. I instead decided to attack them. They offered some scrap and a slave to let them live and I took it. Anyone who has played a bit have any suggestions for how to spend scrap early on? So far I've gone with a couple power upgrades then upgrading my shields. I haven't made it deep enough to really get to more upgrades yet. Also that my ship will have a strict no-clothes policy. With the amount of fires I've had on my ships this is a very bad idea! My ship will have a strict horrific full-body burns policy. I think I'll call it... The Event Horizon! I like an early investment in piloting. It it is cheap, doesn't cost power, and increases your evasion a good bit. Beyond that my investments usually depend on what kinds of equipment I am finding or not finding. If I don't run across any free weapons early on, I will go ahead and start buffing shields. But if I do find a weapon, I will try to get that up and running instead. I also spend a lot on fuel and missiles at stores, and I always repair my hull when I have the chance. I just gang up my crew on them, preferably in the medbay. If I can't get them into the medbay, I will just rotate my guys into heal as they get hurt. Also, upgrade your doors. Upgrade my DOORS?! What manner of magic option is this? It is one of the system upgrade options in the ship menu. Upgraded doors make it so enemies have to break down the doors to move through the ship, and I also believe it slows the spread of fire. Hey - how long is the average game lasting for your guys? I dunno, 20 minutes? Seriously, I'm gonna try Easy level next time. I got to the final boss on Easy last night. I got pretty close to defeating him, I believe, but my weapons just weren't up to the challenge. I used the Engi ship again, this time I had 2 ion beams, a hermes missile launcher, 2 attack drones and a defensive drone. I also outfitted my ship with a cloaking system, which is great for dodging the 3 missile volleys that the boss likes to shoot off every so often. That game probably took around 2 hours or so. And here are a couple from the boss battle. I decided not to embed them so as not to spoil people. New beta build just came down over the pipes via Steam. So the door opening thing was a bug? I thought it was meant to be that way being one of those games where one mistake could spell your doom like Dwarf Fortress or Terraria. Didn't come across the crew dismissing bug mainly because I never had a need to do so being short on crew all the time. I got pretty close to defeating him, I believe, but my weapons just weren't up to the challenge. Probably could've used a few more Lissandras, too. Never mind, need to read more closely lol. I finally got in a couple of games last night after the kids went to bed. I LOVE it. Really looking forward to exploring more over this week. Sadly, on my best game of two, I accidentally closed the window and lost the game. I've probably played about 5-10 games and I'm really really enjoying it. 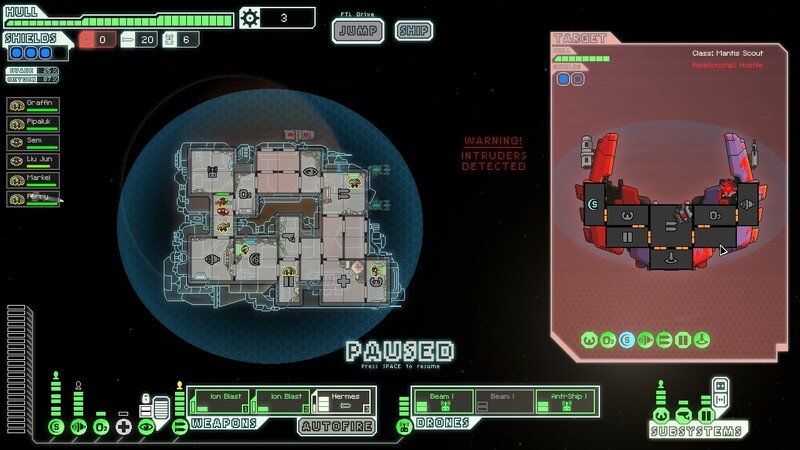 My best on Normal (haven't dropped it down to easy yet) is Sector 6, and that's with the Engi ship. The most crew I've ever managed is 4. My biggest problem seems to be the general attrition and not getting enough scrap to be able to level up. I wouldn't mind (maybe it already exists), an augment that shows the next path from all the next possible systems. It would make planning a lot easier. There is a new build out today. It has a ton of additions, including a new type of sector (a Slug themed one) and a new Slug ship that you can unlock. I finally made it past the first sector! ROCK ON! I can't find FTL on Steam at all. Access to the FTL beta is currently only available for those who contributed at the $25 level or above on the Kickstarter. I think their goal is to have it released sometime in August. As an update they are now hoping to release this game in the fall. I feel like Kickstarter has really helped lead to an explosion in the number of space games which will soon be available, I'm really looking forward to them. I'm finding that if I pick up crew members and upgrade my ship, I run out of fuel. Most of my scores have been in the 1300s, with a few outliers. I've played 1 game on Easy so far, and made it to the final battle, but I went in very wounded and couldn't survive (though I did board their mega vessel, which was fun!). That game was in the low 2000s. My next goal is to roam more and try to unlock the other ships. You definitely want to visit as many sectors as possible to accumulate as much scrap and as many crew members if you can. There are usually plenty of stores around to keep your fuel topped off, so make sure you purchase as much as you need as you find them. I try to keep at least 10 fuel in reserve if I can manage it. I love to explore, but when I see that rebel fleet get close enough, I turn tail and rabbit further away. I need to man up a bit I guess. Me too, this came up before I was watching Kickstarter and I really wish I could be playing this beta. I did just get in on the Star Command Kickstarter, and that actually seems to be built for a very similar itch. Goodness this is a great time for space games. Oh lord tell me about it. When I began my blog last August, I thought my time would mostly be spent with classic games, followed by an occasional new release. The EXACT opposite has occurred. Same here. I wish they'd do a paid alpha/beta/whatever, similar to Starfarer and Minecraft. I'd pony up. Would Kickstarter backers feel their investment was devalued, or a breaking of that 'covenant' if they did that?